An unlucky race day as my first senior race but there are definitely some positives to take from the day. My first time as a senior at Camberley in the dry we were on the pace from the word go setting the 2nd quickest lap time in practice. Heat 1: I started pole. However under estimating the aggression in the senior category I made a bad start and fell to 6th position. I managed to make up one place and finish 5th, setting the 3rd fastest lap of the race. Heat 2: I started 4th and was running in 4th position until another driver drove into the back of me, leading me to face the wrong way. I eventually got going after I fell a lap behind. Once again setting the third fastest lap of the race however I finished 6th. For the third and final heat, I started 8th and had a great race climbing my way up to 3rd and setting the 2nd quickest lap time! Finally gaining confidence in the senior category and getting to grips with the extra speed. Due to a couple of poor heat results I started 7th for the final. I didn’t have the best final race, but once again had the 3rd quickest lap times. I managed to finish 5th. I hope to continue to improve and work hard to achieve some stronger results. 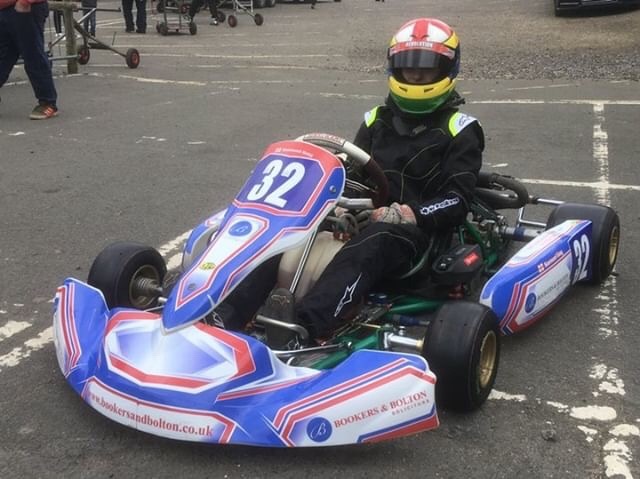 We’re off to Forest Edge Kart Club on the 6th and 7th of April for the first round of the Forest Edge Kart Club Championship where the grids are much larger and more competitive. Fingers crossed it goes well! Many thanks again for the continued support – I hope to bring some good results in soon! Bookers & Bolton are proud sponsors.